For the manufacture of sterile parenterals, i.e. substances which are intended for injection, infusion or implantation into the human or animal body, the issue of sterilization of process equipment is of high priority. In addition to a local cleaning of a process plant, also known as Clean in Place (CIP), many pharmaceutical processes require therefore a subsequent sterilization (sterilization in place). For example this can be ensured by steam sterilization. In this respect all product contacted surfaces should be coated safely and for a defined period with pressurized steam of at least 121 °C. Many pharmaceutical production processes require a reproducible and validated cleaning / sterilization. The cleaning ensures that the processing machinery is not contaminated by the product, also batch integrity is guaranteed. The sterilization is used for a safe elimination of microbial contamination such as bacteria, viruses, fungi and their spores forms. COMBER Process Technology, situated near Milan and part of the HEINKEL Drying and Separation Group, manufactures agitated nutsche filters and filter dryers for years which ensure both necessary process steps – CIP and SIP – at highest level. The manufacture of sterile products often needs closed (contained) process chains. This is why the dry product, often API (Active Pharmaceutical Ingredients), is usually discharged by isolators. They also have to ensure sterility, COMBER therefore applies the method of chemical H2O2 sterilization. 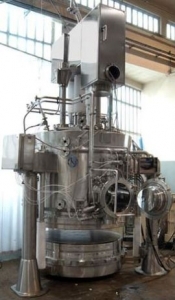 The design of steam sterilisable Pressofiltro® agitated nutsche filters and filter dryers ensures complete sterility throughout the whole process, from inerting to feeding with suspension, filtration, washing and drying to the discharge of the dry product. In compliance with cGMP and FDA guidelines, the vessel interior and all associated piping is designed to prevent product adherence and to facilitate cleanability. The aseptic design (of flanges, seals, valves, etc.) provides a complete drainage of CIP liquid and condensate during the heating process. Based on our experience in design of steam sterilisable Pressofiltro® agitated nutsche filter dryers as well as continuous product improvement, our satisfied customers benefit from quality at highest level. A number of worldwide installed bases for COMBER CIP/SIP solutions speak for themselves.